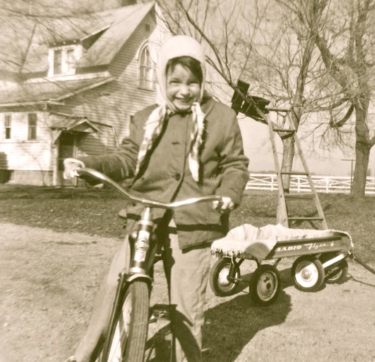 It was harvest time on the farm in the fall of ’61, and I was a self-proclaimed tomboy. My dad and I had spent a warm afternoon parading a convoy of trucks and tractors through the tool shed for repairs. He knew I loved “helping” but he didn’t know I was down below when a spark ignited a can of gasoline. To avoid a larger explosion, he kicked the can down from the combine. The lit can of gasoline hit me in the head and poured down over my face and arms. My dad jumped down from that big red harvester, tried to scoop me in his arms, but couldn’t seem to function. He began to weep. His cry soon turned into more of a wail as he picked me up and started running out of the shed, crying like a little child for my mom. After smothering the fire with a tattered tarp that seemed to materialize out of the thin air, he carried me to the house, laid me on the scratchy couch, and sounded plenty scared while interrupting the neighbor ladies’ party line call. Soon, the big station-wagon ambulance pulled into our lane and my child-like mind started to imagine the scope of all this. First of all, I wondered, why today? The day the soft quilted sofa cover was being washed. I believe the pain was enhanced, to a degree, by that darn, burlapy, piece of furniture we called a couch. Secondly, I asked my dad if he thought the ambulance would sound the siren on the way to the hospital. They did. I felt a stinging sensation throughout my arms but the REAL pain would come later. I do remember looking at the curled and crinkled skin on my arms and thinking it looked like a bag of Jay’s potato chips. An intuitive emergency personnel predicted the doctors and nurses would take care of that in no time. I was then tranquilized, I mean, pacified by them, and to my chagrin, I began to fall asleep to the rhythmic melodies of the siren. The small town church ladies organized meals for my family and countless “Sunshine Boxes”. Everyone donated a wrapped gift and collectively placed them in large decorated boxes. I was hospitalized for nine weeks and I opened a gift every day. Now picture everything you ever drooled over at the 5 & 10 store, or in the grocery check out lane, and those items were in my “Sunshine Boxes.” Everything from gum, candy, Barbie and her legion of accessories, stuffed animals, paper dolls, color-forms, Tinker-toys, Lincoln logs, a racecar set, to money. Lots of money. It wasn’t until I got married in the summer of ’77, and closed that savings account, that I fully understood the concept and meaning of bank interest. My siblings were ecstatic when there were so many gifts that some had to go home with my mom on her daily visits. One of my most memorable gifts came in the form of an authentic child size nurse’s outfit including a hat with a red cross on the front. I still have it. Without a doubt, the heftiest gift of all came later, when I had to wear a splint on my little finger to straighten it. I hated that thing and repeatedly tore it off in my sleep. That is, until the day my Grandpa Frey told me if I got my pinkie straight, he would buy me anything I wanted. 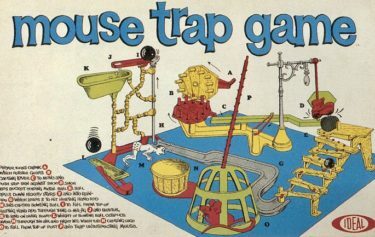 I soon became the proud owner of Milton Bradley’s Mousetrap game. In the pain rulebook, the following must surely be an exception; I had to lay naked in the bed and wait for a nurse to rotate me every few minutes. This kept my burns and skin graft sections from sticking to the sheets. My so-called cover was a wire contraption that arched over me with a sheet woven in and out of the wires. To repair my burns they needed to “take” a thin section of my good skin: buns, stomach, and thighs. Those areas also became susceptible to getting stuck to the sheets. The only pain I remember is when their rotating and tent contraption failed to work. Slowly and meticulously, they would have to separate me from the sheets. OUCH! I was somewhat of the local town hero when it all happened. I’m positive my 2nd-grade classmates were highly coached not to stare or be mean. If good comes from everything, I would have to say that, in a weird way the accident is such a part of me that every once in a while, I need to review the lessons it taught. I’m not a person that considers the outward appearance of others or myself as a trait to magnify. I am not saying I don’t like to look nice, but my philosophy is this; if you have blisters the size of Buicks on your feet from dress shoes, it’s ok to wear tennis shoes even if you are an American tourist in Paris. Childbirth is definitely a pain you don’t remember. In the 1960’s the bank actually paid you money to hold on to yours. For goodness sake, at the very least, I should have asked grandpa for a pony! 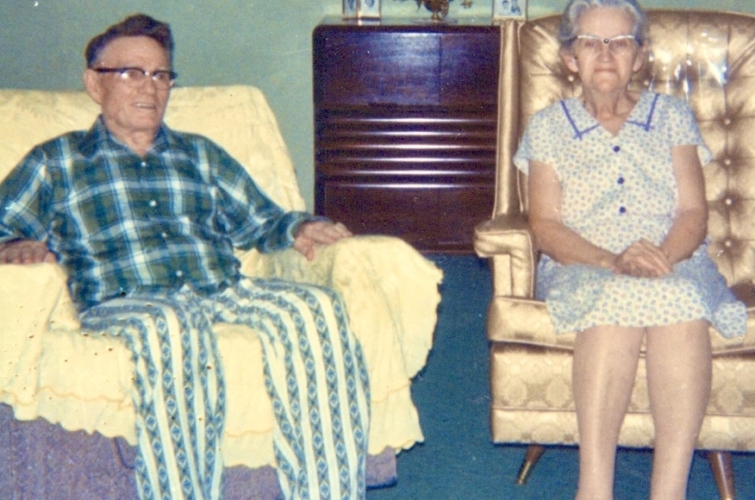 My grandpa passed away when I was in 10th grade, but the only real memories I have of him is him sitting in his chair in pajama pants beside my grandma (like in the picture) He always had a smile on his face but I don’t recall that he said too much. But it was always reassuring to go visit him because I knew exactly the outcome of those visits. We’d say hello, he’d tease us a little and then we’d run outside to play. Maybe my story is more about life and unexpected challenges than it is about my grandpa. I hope that it can be used to inspire and motivate grandpas to make MORE of an impression on their grandchildren. What legacy of memories are you leaving behind? To read more of Julee’s work please visit Grandmas Getting Healthy. Here’s a heartfelt story of a grandpa’s legacy of precious memories – one photo at a time.